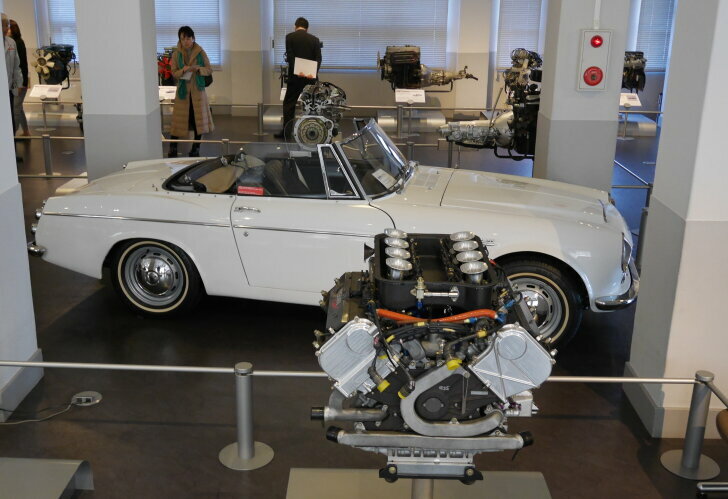 Motor museum | When going on a holiday to Yokohama (Japan), you might choose to visit the obvious tourist attractions. Yokohama has a great theme park, many monuments, a museum ship, the tallest building in Japan and the largest "China town" outside China. 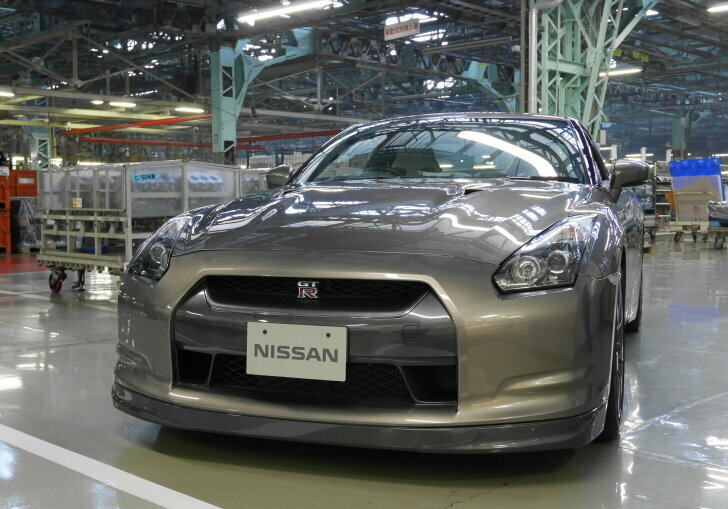 For motoring enthusiasts Yokohama offers another attraction: the Nissan factory. Autozine paid a visit. Around 1933 Nissan, then named "Jisosha Seizo", opened its first office. It was located in Yokohama because it offered space and good connections to the mainland and the harbour. Quickly, Nissan expanded with new buildings and new grounds. Right now, the plant takes up 537,000 m2 and employs 3,400 workers. The historic first office has always been preserved and is now a museum. However... this isn't another car museum! 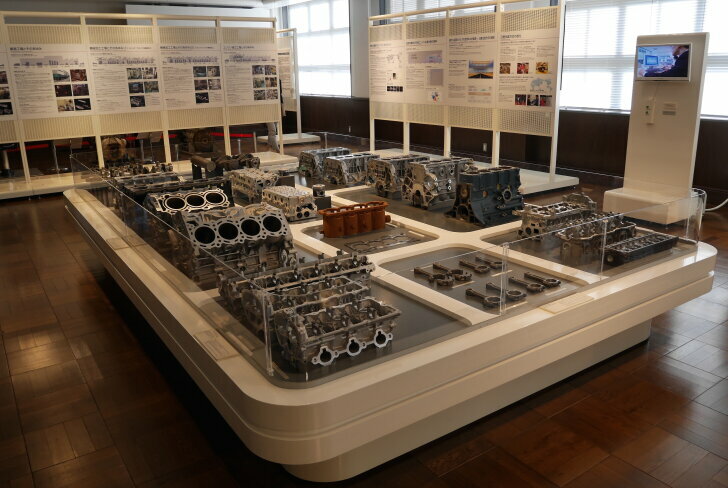 In the adjacent factory Nissan only builds engines, so this museum is dedicated to the history of Nissan's engines. Right by the main entrance, all the engines built by Nissan are neatly lined up. Even the electric engine, Nissan's current pride and joy, hasn't been forgotten. However, emphasis is on internal combustion engines. Several models explain the inner workings of such an engine, so the museum is even suitable for children. Throughout the museum, Nissan shows how technology has developed and evolved. 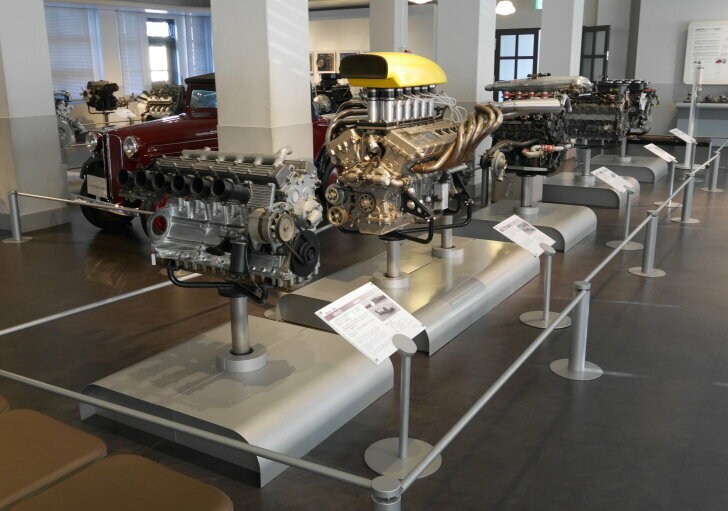 The first Nissan (or rather: Datsun) engine on display is from 1935 and thanks to its modest displacement of only 722 cc, cars equipped with this power-train could be driven without a licence. In 1953 Nissan licensed an engine from British carmaker Austin to learn and expand. Over the years, engines grew stronger and more frugal. In fact, Nissan proved to be a true pioneer in the field of engine technology. Again, thanks to interactive displays visitors can actually experience the technical improvements. For example, guests can feel what the influence of a balancer is like or feel the difference between a traditional and a lightweight valve lifter. The curator of the museum, mister Maeda, explains about the items on display with a passion. His stories turn cold pieces of steel into fascinating tidbits of history. For example, Nissan once built a bespoke car for the emperor's driving lessons. He liked it so much, that he later requested Nissan to build a special low-speed engine for a car used in ceremonies. On request, a visit to the engine museum can be completed by visiting the engine factory. Nissan's current engine plant is located literally on the other side of the street. The average engine consists of some 400 parts, but only a few are actually created here. Most parts are bought from nearby companies. The parts being produced in Yokohama are large pieces like the actual engine block, the pistons and the engine cover. In a large building all parts are assembled into the final product. Every step of the production processed is carefully monitored by robots to reduce faults to a minimum. However, one engine is produced in a completely different way. 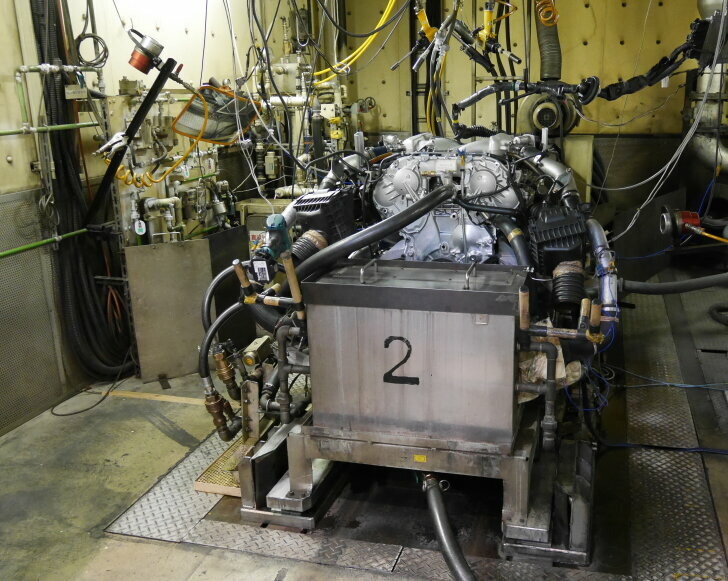 In Yokohama the engine for Nissan's super sports car, the GT-R, is being built as well. In this part of the factory a whole different set of rules apply. Instead of computers and robots, it is people who assemble and fine-tune each engine by hand. To make it even more special, production takes place in a so-called "clean room" where both temperature and humidity are constant. Only the very best students of Nissan's in-house school for engineers are eligible to work here. They are called "Takumi", which loosely translates into "grand master engine builder". 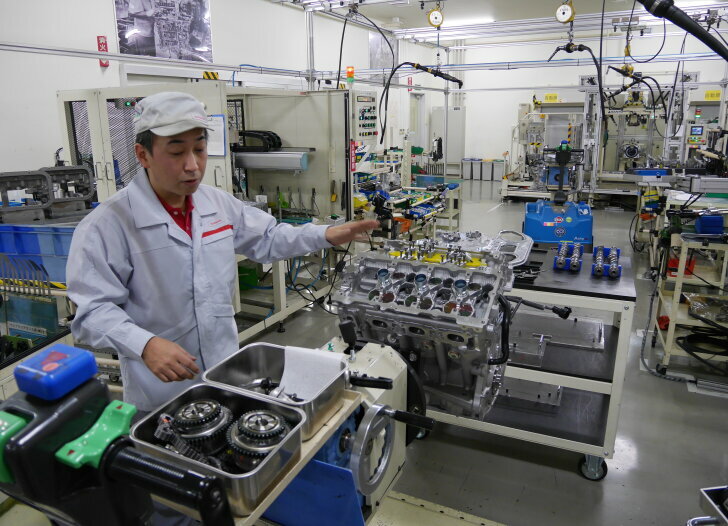 At the moment, Nissan employs only four takumi who are licensed to work on the GT-R.
Just by feeling and hearing, the takumi work within margins so narrow that even the most sophisticated equipment cannot measure. However, a few micrometre more or less leeway in the heart of the engine can make a big difference with a powerhouse like the GT-R.
Every engine is tried and tested to the level that the turbo glows all red. Not to waste energy, the power from the engine being tested is used to drive a generator which in turn generates electricity for nearby offices. Only when the engine passes all 33 (!) tests, can the takumi place a label with his name on the engine. In that way he is always responsible for his work. When asking takumi Kurosawa if he ever received a complaint about his work he simply laughs and answers: "no, only compliments". The Japanese city of Yokohama, near Tokyo, offers many tourist attractions. For car buffs, the Nissan factory is certainly one of those. The engine museum provides a clear and interesting insight into the Nissan brand and its technology. Most information is available in Japanese and English. On request, the nearby Nissan engine factory can also be visited. However, do bear in mind that this is just an engine factory, which isn't as spectacular as a car factory. Also, the visitor is kept at a distance because guests view the plant from an elevated walkway. Those who buy a Nissan GT-R, and ask very nicely, may witness the birth of the heart of their new car. While the other engines are assembled by computers and robots, building the engine of a GT-R is more like sculpting a piece of artwork. Merely by feeling every engine is fine tuned-into the product that Yokohama is renowned for.